This Dragon is always ready for the beach and knows how to soak up the sun. The sea is his sanctuary and makes him relaxed and chilled. He’s very friendly and won’t attack… unless you remind him one too many times to put sunscreen on. Beach is not Currently Breedable. Sorry. 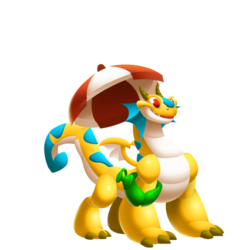 These dragons can all critical hit against Beach, but won't be critical hit by Beach.